The time: 1100 AD. The place: the Arizona desert. The mystery: an emerging pattern of Hopi villages mirrors all the major stars of the Orion constellation. The Orion Zone: Ancient Star Cities of the American Southwest explores this terrestrial-celestial relationship and its astounding global significance. 343 pages, perfect-bound trade paperback, glossy cover, 6" X 9"
To watch Orion ascend from the eastern horizon and assume its dominant winter position at the meridian is a wondrous spectacle. Even more so, it is a startling epiphany to see this constellation rise out of the red dust of the high desert as a stellar configuration of Anasazi cities built from the mid-eleventh to the end of the thirteenth century. In fact, Orion provided the template by which the Anasazi (ancestral Pueblo people) determined the locations of their villages during a migration period that lasted centuries. Spiritually mandated by a god the Hopi call Masau'u, this "terrestrial Orion" closely mirrors its celestial counterpart, with prehistoric "cities" corresponding to every major star in the constellation. The sky looks downward to find its image made manifest in the earth; the earth gazes upward, reflecting upon the unification of terrestrial and celestial. Extending from the giant hand of Arizona’s Black Mesa that juts down from the northeast, three great fingers of rock beckon. They are the three Hopi Mesas, isolated upon this desolate but starkly beautiful landscape to which the Ancient Ones so long ago were led. Directing our attention to this "Center of the World," we clearly see the close correlation to Orion’s Belt. Mintaka, a double star and the first of the trinity to peek over the eastern horizon as the constellation rises, corresponds to Oraibi and Hotevilla on Third (West) Mesa. The former village is considered the oldest continuously inhabited community on the continent, founded in the early twelfth century. About seven miles to the east, located at the base of Second (Middle) Mesa, Old Shungopovi (initially known as Masipa, a cognate of the deity Masau’u) was reputedly the first to be established after the Bear Clan migrated into the region circa A.D. 1100. Its celestial correlative is Alnilam, the middle star of the Belt. About seven miles farther east on First (East) Mesa, the adjacent villages of Walpi, Sichomovi, and Hano (Tewa) --the first of which was established prior A.D. 1300-- correspond to the triple star Alnitak, rising last of the three stars of the Belt. Nearly due north of Oraibi at a distance of just over fifty-six miles is Betatakin ruin in Tsegi Canyon, while about four miles beyond is Kiet Siel ruin. Located in Navaho National Monument, both of these spectacular cliff dwellings were built during the mid-thirteenth century. Their sidereal counterpart is the double star Rigel, the left foot or knee of Orion. (We are conceptualizing Orion as viewed from the front.) Due south of Oraibi approximately fifty-six miles is Homol’ovi Ruins State Park, a group of four Anasazi ruins constructed between the mid-thirteenth and early fourteenth centuries. These represent the irregularly variable star Betelgeuse, the right shoulder of Orion. Almost forty-seven miles southwest of Oraibi is the primary Sinagua ruin at Wupatki National Monument, surrounded by a few smaller ruins. ("Sinagua" is the archaeological term for a group culturally similar and contemporaneous to the Anasazi.) Built in the early twelfth century, their celestial counterpart is Bellatrix, a slightly variable star forming the left shoulder of Orion. About fifty miles northeast of Walpi is the mouth of Canyon de Chelly, where another national monument is located. In this and its side Canyon del Muerto a number of Anasazi ruins dating from the mid-eleventh century are found. Saiph, the triple star forming the right foot or knee of Orion, corresponds to these ruins, primarily White House, Antelope House, and Mummy Cave. Extending northwest from Wupatki/Bellatrix, Orion’s left arm holds a shield over numerous smaller ruins in Grand Canyon National Park, including Tusayan near Desert View on the south rim. Extending southward from Homol’ovi/Betelgeuse, Orion’s right arm holds a nodule club above his head. This club stretches across the Mogollon Rim and down to other Sinagua ruins in the Verde Valley. As a small triangle formed by Meissa at its apex and by Phi1 and Phi2 Orionis at its base, the head of Orion correlates to the Sinagua ruins at Walnut Canyon National Monument together with a few smaller ruins in the immediate region. This variation could be due either to cartographic distortions of the contemporary sky chart in relation to the geographic map or to ancient misperceptions of the proportions of the constellation vis-à-vis the landscape. Given the physical exigencies for building a village, such as springs or rivers, which are not prevalent in the desert anyway, this is a striking correlation, despite these small anomalies in the overall pattern. As John Grigsby says in his discussion of the relationship between the temples of Angkor in Cambodia and the constellation Draco, "If this is a fluke then it’s an amazing one.... There is allowance for human error in the transference of the constellation on to a map, and then the transference of the fallible map on to a difficult terrain over hundreds of square kilometers with no method of checking the progress of the site from the air. "* In this case we are dealing not with Hindu/Buddhist temples but with multiple "star cities" sometimes separated from each other by more than fifty miles. Furthermore, we have suggested that the "map" is actually represented on a number of stone tablets given to the Hopi at the beginning of their migrations, and that this geodetic configuration was influenced or even specifically determined by a divine presence, viz., Masau’u, god of earth and death. When the Anasazi gazed into the heavens, they were not looking at an extension of the physical world as we perceive it today but were instead witnessing a manifestation of the spirit world. Much like the Egyptian Duat, the Hopi Underworld encompasses the skies as well as the region beneath the surface of the earth. This fact is validated by the dichotomous existence of ancestor spirits who live in the subterranean realm but periodically return to their earthly villages in the form of storm clouds bringing the blessing of rain. Even though the eastern and western domains ruled by Tawa (the Sun) remain constant, the polar directions of north and south, controlled by the Elder and Younger Warrior Twins (sons of the Sun) respectively, are reversed. Thus, the right hand holding the nodule club is in the east and the left hand holding the shield is in the west, similar to the star chart. However, the head is pointed roughly southward rather than northward. This inversion is completely consistent with Hopi cosmology because the terrestrial configuration is seen as a reversal of the spirit world, of which the sky is merely another dimension. At any rate, looking up at Orion on a midwinter night, we can imagine that our perspectives have switched and that we are suspended high above the land, gazing from the northeast to the southwest toward the sacred mountains of the kachinas (San Francisco Peaks) and the head of the celestial Masau’u suffused in the evergreen forests of the Milky Way. Ironically, it is here on the high desert of Arizona that we also intuit the truth of the hermetic maxim attributed to the Egyptian god Thoth (Hermes Trismegistus): "As above, so below." *Grigsby cited in Graham Hancock, Santha Faiia, Heaven’s Mirror: Quest For the Lost Civilization (New York: Crown Publishers, Inc., 1998), p. 127. Gary A. David is an independent researcher and writer living in northern Arizona. 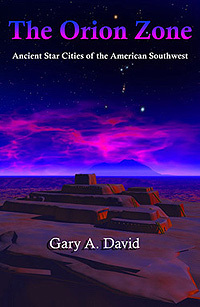 The Orion Zone: Ancient Star Cities of the American Southwest is now available from Adventures Unlimited Press. This book discusses a correlation between the stars of Orion and the Hopi villages and ruins in the Four Corners region of the US. Recently Mr. David’s articles have appeared in Atlantis Rising, Fate, and World Explorer magazines. He is also a published poet.